There’s now even more to Catch Up®! 14th September 2016 - There’s now even more to Catch Up®! We were delighted to be joined at our lunchtime and teatime seminars in Cardiff recently by so many schools in Wales (and one from Berkshire! ), to share news of our new support resources for Catch Up® Coordinators and deliverers. Teachers, teaching assistants and advisers heard Catch Up® Director, Julie Lawes, explain what we have added to the Catch Up training and support package, with new support available to help Catch Up® Coordinators set up the interventions in school, and embed them, and to help both deliverers and Coordinators enhance their Catch Up® practice. Julie showed sample clips from our new online management videos, which take the person responsible for managing the intervention through ‘Introducing’ the intervention and ‘Supporting and monitoring’ delivery. She then explained the new training opportunities that are going to be available every term at our Regional Training Centres, including our Review and Refresh sessions, Coordinator network meetings and in-depth workshops. Julie then showed a preview of our Progress Reporting tool, due to launch later this term. This tool will enable schools to easily record assessment data, and produce pupil and group reports at the click of a button, to show the progress that is being made using Catch Up®. We also had time for two Excellence Awards, which we were delighted to present to Jenner Park Primary School and to Priory School, who had travelled all the way from Berkshire to be with us. Debbie Rowan, Jenner Park Primary, and Stefanie Pearce and Natalie Perry, Priory School, collect their awards from trustee Sioned Bowen. Delegates scored the event an average of 4.6 (where 5 is ‘most helpful’), with many saying that they found information about the new tools and training very interesting and think they will be of enormous benefit at school. 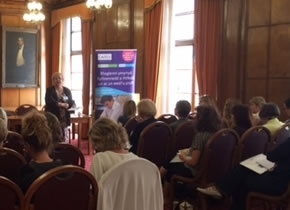 Delegates also commented on the excellent venue, how welcome they felt and how much they valued the opportunity to speak with other trainees and Catch Up® staff. 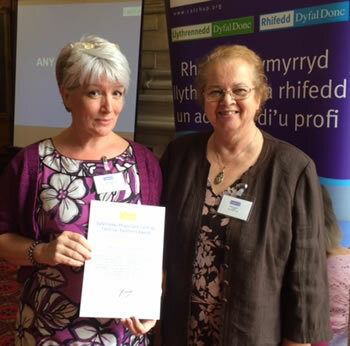 The only suggestion for improvement was to hold more seminars in other parts of Wales! 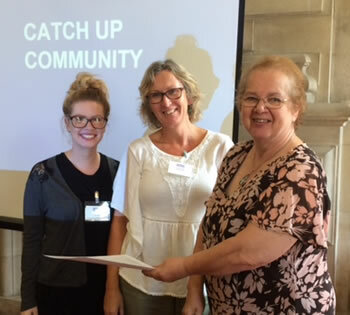 Thank you so much to all of the teachers, teaching assistants and others who joined us, and thanks to Cardiff University and all of the Catch Up® team and staff for helping to make this such a successful launch event!